Maia Oropeza 1.- Get into the online store. 2.- Add to the cart the items that you need to buy. 3.- Apply this promo code at checkout. 4.- Save 15% off your entire purchase. Offer ends 05/16/17 at 11:59 PM ET. One coupon per customer. Enter promotion code at checkout or bring coupon to shops. Discount will not be applied to shipping charges, taxes, gift cards, in-shop phone orders, gift packaging or donations. The discount will be applied as a percentage discount on each item in your transaction. You will receive the price paid (after the discount) on all returned or exchanged merchandise. Original coupon must be presented and will be collected at time of in-shop purchase. Not valid for cash. No adjustments will be made to prior sales. Purchases made with this offer are not eligible for a price adjustment. Shipping may take 7-10 business days after Janie and Jack has processed the order to arrive at the destination. Promotion not valid on Express or Rush shipping or for shipments to AK, HI, APO/FPO locations or U.S. territories. A fee of $6.95 will be deducted from your order refund for return postage when you use the return label enclosed with your shipment. Promotion not valid on international shipments or in retail stores. 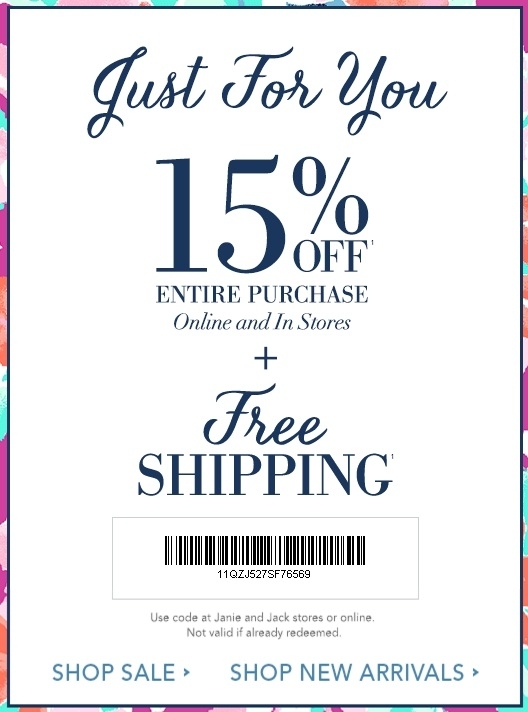 Cannot be combined with any other offers or promotions, except as described on janieandjack.com. Offer may not be redeemed for cash. Lost, stolen, expired, or destroyed coupons will not be replaced. Offer may not be transferred in any way. Any violation of the above will result in deactivation of the affected coupon. Janie and Jack and its affiliates’ employees and franchisees (and their spouses/domestic partners) are not eligible to participate. Janie and Jack reserves the right to change or cancel this promotion at any time. Use of this offer constitutes acceptance of these terms and conditions, except where prohibited by law. Not valid at Janie and Jack Outlet or global.janieandjack.com.